To Cut Student Debt, Florida College Cuts Off Some Student Borrowing : NPR Ed One of Florida's largest community colleges is trying to reduce the amount of debt its students take on. As part of a federal experiment, it has barred them from taking out any unsubsidized loans. 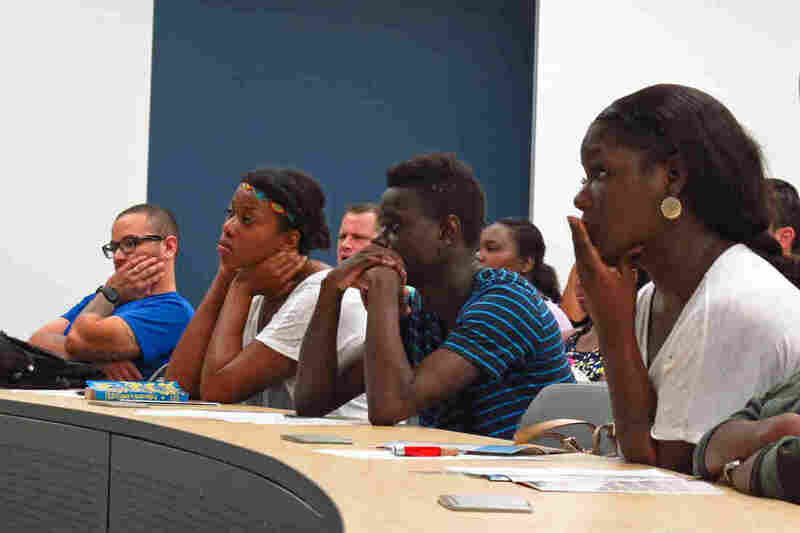 Students at Broward College in Fort Lauderdale, Fla., attend a debt management workshop. Broward is one of 29 colleges that no longer accepts unsubsidized student loans. The effort is part of an experiment to cut down on student loan debt and defaults. To get a student loan at Broward College, one of Florida's largest community colleges, you first have to sit through a two-hour financial lesson with Kent Dunston. It's a little like Scared Straight, the 1978 documentary designed to keep kids from ending up in prison. Dunston's lesson, though, is about scaring students into making good financial choices. Nationwide, student loans total more than $1.2 trillion. And schools now face punishment — even closure — by the federal government if the rate is too high. You're not going to borrow more than the amount of money you need to attend, Dunston tells the students. "You'll be offered more. You don't need it." Broward College, in Fort Lauderdale, Fla., launched this class six years ago, just one effort aimed at preventing students from taking on so much debt that default on their loans. And, starting this year, the school began trying something else: barring students from borrowing more than they need. The school stopped accepting unsubsidized loans — those are the more expensive federal loans that require students to begin making interest payments right away. (The federal government pays that interest on subsidized loans while a student is enrolled). Broward, along with 28 other community, four-year and online colleges around the country, is trying the subsidized-loan-only approach as part of an experiment with the federal government to cut down on student debt. Subsidized loans can wait until after a student graduates for payment. And while the federal experiment limits access only to federal unsubsidized loans, Broward has gone even farther — it has stopped accepting private loans, too. Dunston is in charge of monitoring student loan defaults for Broward College, with a student population of more than 60,000. "We want to assure ourselves that they understand what the hooks are on the back end of these programs," Dunston explains. About 75 students were in his class on a recent day, listening as he tells them the story of a young woman concerned about how her $137,000 student debt might affect her chances of getting married. "That can throw a lot of cold water on a relationship, unless the guy can say, 'Well, that's OK baby, I owe $87,000 myself,' " Dunston says. Broward student George Aleman thinks he owes about $60,000 in student loans. The middle-school dropout, who went on to complete his GED, came to Broward already owing that much in debt from a previous attempt at trade school. The Broward College admissions and financial aid staff "couldn't believe that I owed so much, and I only have an associate's degree," he says. Broward told Aleman that he was almost maxed out, and could only access loans for one year of tuition. After that, the school says, Aleman will be on his own. "I'm just starting to find something I really want to expand in and I'm hitting a brick wall now," Aleman says. But Broward officials say capping loans is not a barrier for most students. Bob Robbins, associate vice president of student affairs, says the school has not seen enrollment decline because students no longer have access to unsubsidized loans. "One of our big concerns is what the student impact would be, and we were really, really surprised at what happened — we didn't see many complaints," Robbins says. That could be because Broward's tuition is only $2,400 a year, a sum that income-based federal Pell Grants can help cover. And community college students aren't the ones borrowing too much, says Debbie Cochrane with the student advocacy group The Institute for College Access and Success. Cochrane fears that rejecting unsubsidized loans may force some students to turn to credit cards or other high-interest loans to pay for school and living expenses. "So the downside of limiting students' access to federal loans is that they will have to go these routes that are not nearly as preferable," she says. But Broward officials proudly cite their default rate, which has gone down in the last three years. The most recent numbers available, from 2011, show that 12 percent of Broward students default on their loans — lower than the national rate of 13.7 percent.